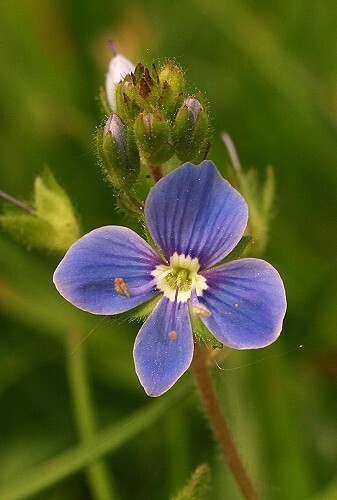 Germander speedwell is a pretty flower with four bright blue petals and a white eye in the centre. The flowers are about 1 cm diameter. The heart-shaped leaves are toothed and hairy. It is a common flower in woodland, hedgerows and gardens and in the past was used in herbal medicine to treat coughs and catarrh, and as blood tonic.